This magazine from 1973 was an interesting concept. A “how to” manual with good solid advice on how to set out a script and basic advice on lettering and artwork. I’m sure Charlton, along with all the other comic book companies of the time received unsolicited submissions in biro/pencil/on the backs of cereal packets! This was a nice thing to hand out to people explaining that a good starting point was to produce something neat,clean and tidy. Useful advice included keeping a “swipe file” and “plenty of erasers”. I presume this magazine was sold at conventions as well as being available by mail order/with subscriptions. 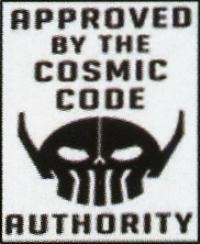 This magazine was the first time I’d seen the Comic Book Code spelt out in its entirety. I’ve been looking for this one for a while. I had 2 copies, one I recieved as a bonus for subscribing to Ghostly Tales and then lost sometime later, the other when I sent a letter to Charlton Comics asking if they had anymore and that I would happily buy one. I recieved a copy of the guide, as well as a note from the editor George Wildman letting me know that was the last copy they had. I cherished that guide for years, even using it when I taught cartooning classes (I passed out mimeographs of it). Sadly, it has been lost for several years now. One day I’ll possess a 3rd and final copy. Its great to hear from somebody who actually subscribed to a Charlton Comic!! Here in the UK I had to get what I could from the spinner racks. Nicola Cuti is to be applauded for this fascinating (and useful) book.